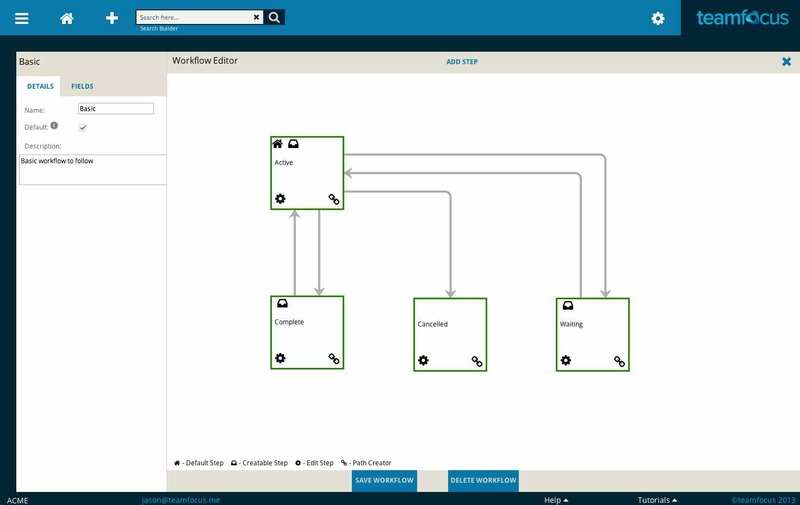 Watch this short video to learn about using Steps within Workflows. This video continues the series on Workflows and focuses on Fields. Workflows are at the heart of teamfocus. 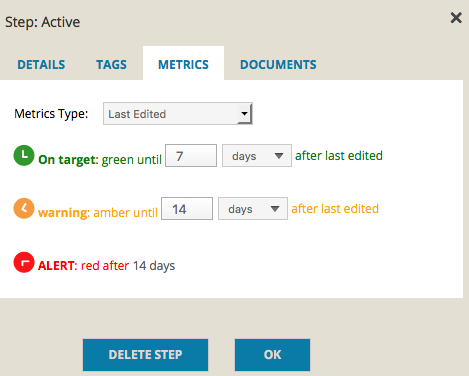 Every Task in teamfocus exists in a Workflow, and at a particular step like “Active” or “Complete”. This is how you control which steps a Task must follow, as well as the order of these steps. Under the Settings menu (the Cog icon) in the top right hand corner, select ‘Workflows’ to enter the workflow editor. Each Team has one Workflow marked as the ‘default’ (it has a little house next to it). Click the plus sign on top of a View to perform a ‘Quick Add’. This Workflow will be used for the new Task. Workflows for your Team are defined on the left. Clicking on one of these will open the Workflow for editing. You can edit details about this Workflow such as its name, a description and whether or not it’s the default Workflow. 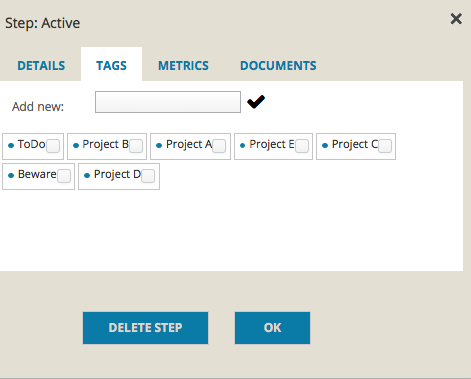 Each Workflow includes a default step that’s used when creating Tasks within it. In the Workflow Editor, the default step has a house icon. Sometimes, it’s useful to create steps that are part-way along the Workflow – or even at completed steps – for reporting reasons. Each step in the Workflow can be designated as a ‘creatable’ step. This means that a Task can be created at this step. The image shows you the details on the step “Active”. This is a step in the Workflow. As you can see, it’s creatable, and also marked as the default step for this Workflow. If you need to edit the Tags on this step, click the Tags tab and the following will display. This is where you can add Tags on a step (view more info on Tags). 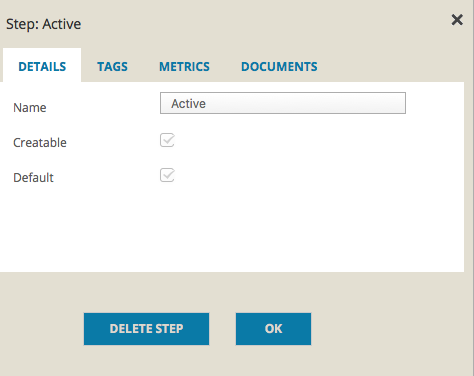 If you need to change the Metrics for a step, click on the Metrics tab (View more info on Metrics). 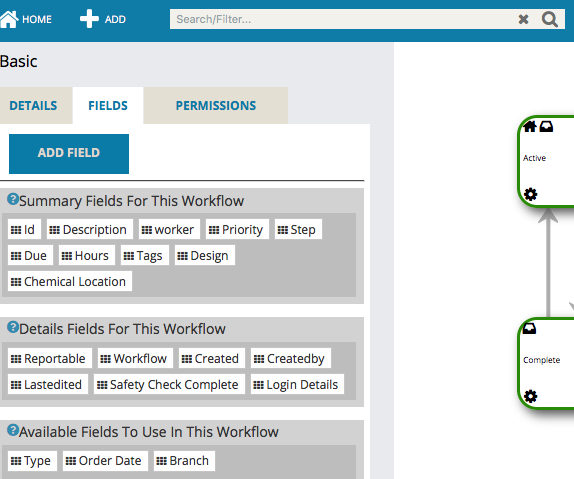 Click on ‘Fields’ (on the left hand side) to view the Fields that are setup on this Workflow. 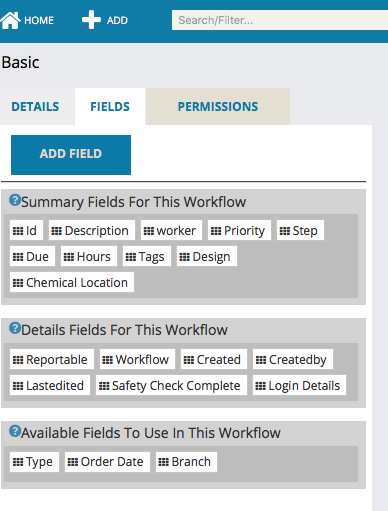 Each Task that is in this Workflow will include these Fields. Only Summary Fields will be displayed in the results for a Search or a View. Some Fields on the right are defined as Summary Fields, so these will display in a Task‘s search results. Fields such as ‘Design’ etc, will only show when a Task is expanded by clicking on the pencil icon on each task. Once it’s defined, a Field is available for the whole Team. ‘Order Date’ (above image) is defined, but is not used on these Tasks. It’s available here, so that if multiple Workflows need similar Fields, they don’t have to be defined every time. Each step in a workflow is connected to another step so tasks can flow from one to another. Each Connection can be marked as a ‘default’ Connection, which will mean it’s at the top of the list when users want to move the Task to a new step. Only the Connections you make here can be followed, so ensure all Tasks follow the path you need. Connections, or paths, can also have Tags associated with them. This means that a Task will have a Tag automatically applied at the next step, because it followed a particular Connection. It’s possible to have multiple paths between two steps. This allows for such things as putting different Tags on a Task at a certain step, based on which Connection it followed. You may have an Active step, which has two Connections to ‘Cancelled’, and the path chosen can indicate why the Task was cancelled. Click the check mark on the left to save a Workflow. Click on the X to close the Workflow Editor for this Workflow, and return to your Workflow list. When you’re finished editing Workflows, click Home to return to the teamfocus home page, where your Lists are displayed.